This comprehensive manual on hand-cut joinery shows how to create almost any traditional furniture joint quickly and accurately using hand planes. 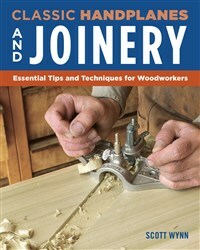 Readers learn how to choose, set up, maintain, and master the most popular joinery planes, with technically rich diagrams, illustrations, practical advice, and skill-building exercises. A fourth generation craftsman, Scott brings a lifetime of involvement in craft, art, and design to his work. He has a broad base of hands-on experience as a carpenter, cabinetmaker, woodcarver, luthier, building contractor, and architectural designer. Scott has maintained a professional shop providing furniture, cabinetry, and woodcarving since 1976. Author of The Woodworker’s Guide to Handplanes, he has written and illustrated articles on the craft of woodworking for Fine Homebuilding, Fine Woodworking, and Woodwork magazines.